Post-cardiotomy mediastinitis is an especially serious complication after the implantation of prosthetic vascular grafts. Standard of care is irrigation, debridement, and removal of all prosthetic material present in the surgical field. 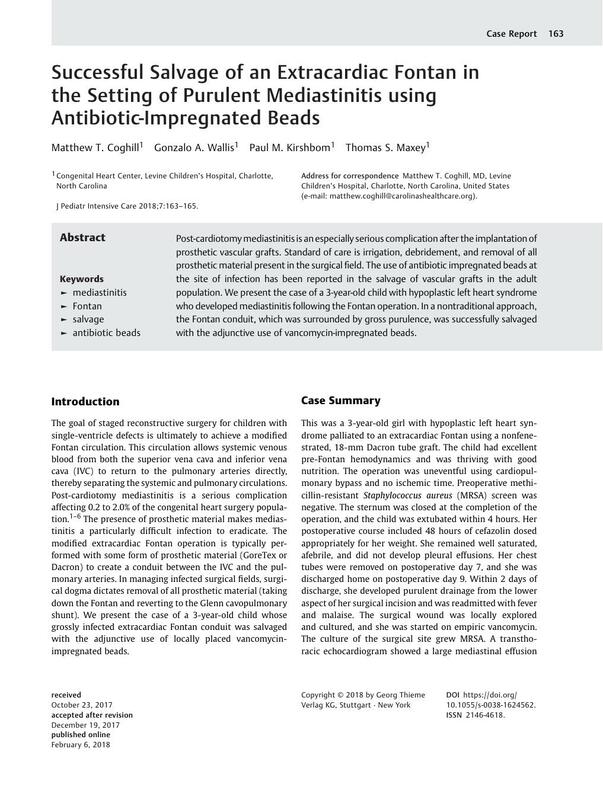 The use of antibiotic impregnated beads at the site of infection has been reported in the salvage of vascular grafts in the adult population. We present the case of a 3-year-old child with hypoplastic left heart syndrome who developed mediastinitis following the Fontan operation. In a nontraditional approach, the Fontan conduit, which was surrounded by gross purulence, was successfully salvaged with the adjunctive use of vancomycin-impregnated beads.